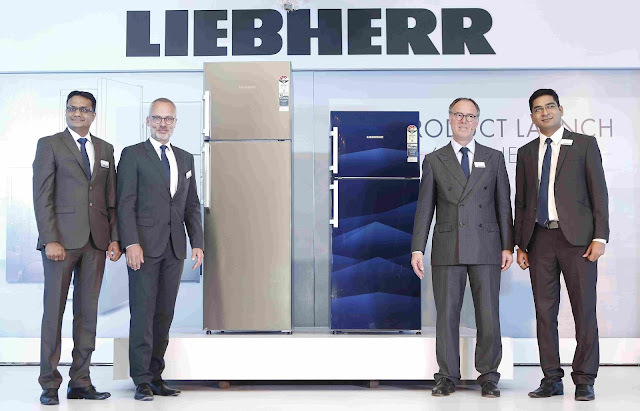 June 06, 2018: Mumbai: Legendary German refrigerator manufacturer, Liebherr unveiled its product range for the Indian market today. This unique range of refrigerators in the mass premium segment will be available across its dealership network in major Indian cities spanning across south, west and north regions of India. The price range for these refrigerators begin from ₹ 23,500 for the basic model to ₹ 1,50,000 for the top end models. The refrigerators are manufactured at Liebherr Appliances India’s Aurangabad Factory which was inaugurated last month. What makes Liebherr products distinct in the Indian market is that they have been carefully designed, post three years of extensive research & development, to bring the best of German engineering technology in a manner that suits the Indian market. The company has launched 19 models in multiple capacities ranging from 220 Litres to 442 litres. The refrigerators come with features like central power cooling technology, 5 star energy efficiency BEE ratings & host of other features which are specially designed to cater to India's ever-evolving lifestyle and culinary culture. Merging elegant design and industry-leading technology, the well-designed refrigerators come in three colour variants which are Stainless Steel finish, Blue Landscape and Red Bubble patterns to suit today’s globally exposed consumer needs. For the current range, Liebherr has put in place a robust distribution network of around 500+ Showrooms across 50+ cities in various regions. This includes partnership with organised retailers and local organised players in the country to retail the products. The products will be available at retail outlets across the country from 2nd week of June’2018. The new launch across segments will be promoted through a holistic 360 degree marketing activities that includes a robust press campaign supported with a strong digital marketing campaign and region-specific outdoor, BTL activities. To Maintain our global service standards, in India Liebherr have already set up service partners at all the locations where they are going to sell and the customer care helpline 1800 2333 444 is already operational to cater to any sort of customer queries.